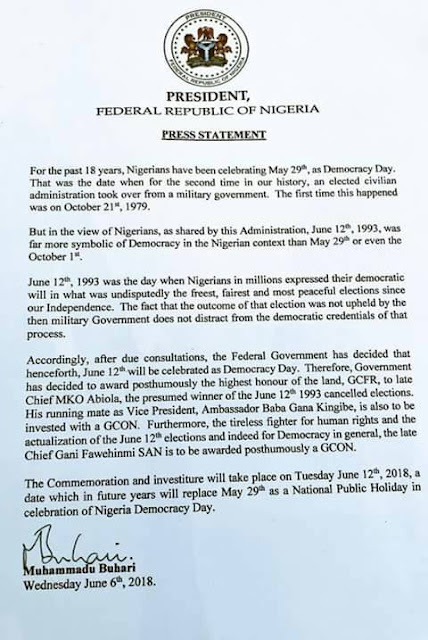 President Muhammadu Buhari has announced June 12 as the new date which Democracy Day will be celebrated in Nigeria, Channels reports. He also conferred a posthumous GCFR title on Moshood Abiola, the presumed winner of June 12, 1993, presidential election. The President in a tweet on his official handle yesterday explained why June 12 will replace May 29. He noted that June 12 is a more symbolic day. President Buhari also conferred a national honour on Baba Gana Kingibe and recognised late Gani Fawehinmi for his role in the actualisation of the June 12 elections. “Chief Abiola’s running mate, Ambassador Baba Gana Kingibe, is also to be awarded a GCON. 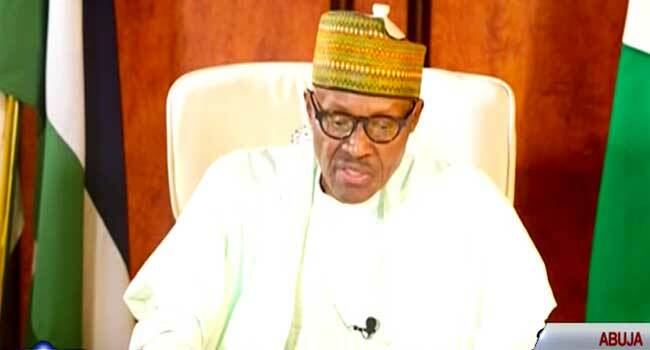 Buhari said further that, June 12, 1993, election was the freest, fairest and most peaceful election since Nigeria’s Independence. 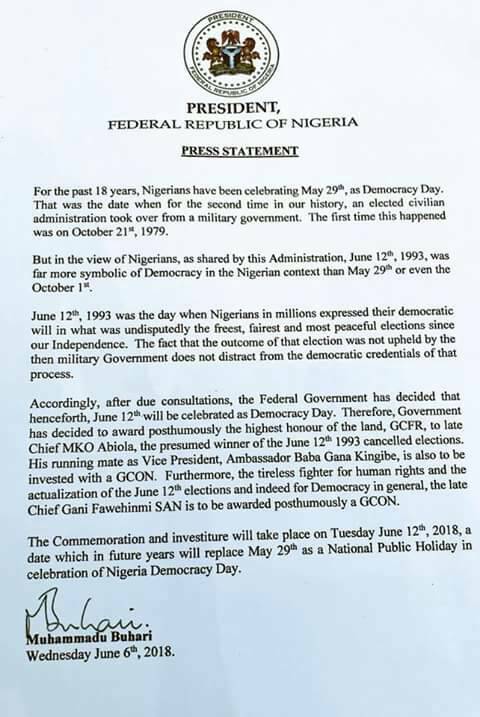 “June 12, 1993, was the day millions of Nigerians expressed their Democratic will in the freest, fairest and most peaceful elections since our Independence. That the outcome of that election was not upheld by the then military Govt does not detract from its democratic credentials,” he said. Attached below is the copy of the Press Statement issued by President Buhari to that effect.